In novel form, a contemporary alt-country ballad of heartbreak, failure, love, and unquenchable yearning. 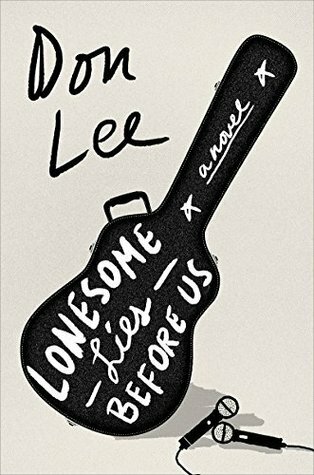 Drawn to the music of indie singer-songwriters like Will Johnson, who helped shape the lyrics in this book, Don Lee has written a novel that unforgettably captures America’s yearnings. Yadin Park is a talented alt-country musician whose career has floundered— doomed first by his homely looks and lack of stage presence and then by a progressive hearing disorder. His girlfriend, Jeanette Matsuda, might have been a professional photographer but for a devastating heartbreak in her teens. Now Yadin works for Jeanette’s father’s carpet-laying company in California while Jeanette cleans rooms at a local resort. Lonesome Lies Before Us has a lot going for it. The story idea is interesting, and I loved the way Lee ties in with the ideas of alt-country music, making the novel mirror a song. As a keen amateur musician myself, I could appreciate Yadin's struggles and understand his predicament. Like most creatives, he's trapped between the desire to pursue his dreams and the realisation that such a life isn't financially viable. I enjoyed reading Yadin and Jeanette's tale, yet I would have liked to connect with them on a deeper level. Throughout, I felt that my care for them, and how their stories would end, was peripheral. For me, this book hovers between 3.5 and 4 stars. I would recommend it for readers of light literary fiction who are also into music and looking for tales in that setting.